What is the best RV or home furniture that you can’t live without? There are many things that I can’t live without but the one piece is furniture that I absolutely love is my Home Reserve couch. When we first bought our camper, Montana Mountaineer 350QBQ, we had them remove the couch and table and chairs in the living room. We made a craft area for Huggs and I and used camp folding chairs for seating (not very comfortable). Disclaimer: Home Reserve did not give me anything for free or ask me to write this review. I love the furniture so much I just wanted to share with other about how great they are. Ordering online: This is the easiest thing I have ever done. You basically pick the pieces you want hit the order button and then with in 24 hours they send you a confirmation. It takes about 10 days to make the couch and deliver the furniture UPS and ours came right on time. They sent me a tracking number and it was delivered with no problem. Packing and Assembly: We ordered sectional pieces which came in a box small enough to fit in the small camper doors. 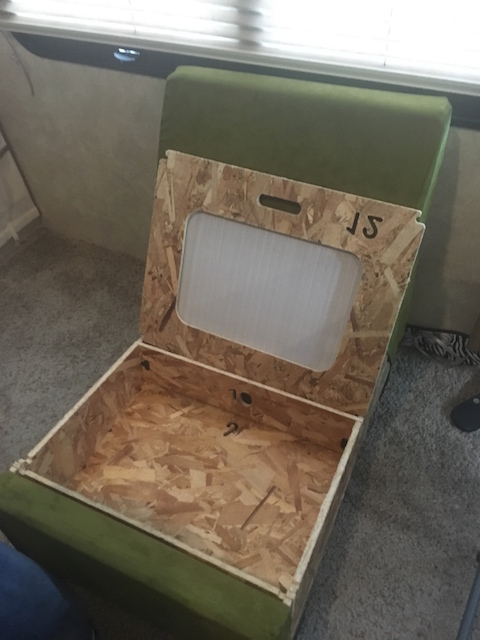 Everything came in one box with very easy to follow instructions, each wooden piece was numbered and fabric and padding came vacuumed packed. The first piece assembly went slowly but once we got the hang of it the assembly went really fast. The pieces fit together like a glove and are light enough the girls can move them around if they need to. Damage or Fabric Change: If your dog decides to destroy a cushion or your child (or you) spill chocolate milk on couch you can replace individual pieces. The best part is that each individual fabric section, foam, or wood part can be replaced or taken off and cleaned. Say you want leather on the bottom of your couch instead of what you originally ordered just call customer service order just the bottom half of each sectional and then (boom) a new looking couch. You can even add sectional pieces or take them away if you decide. Home Reserve furniture is renewable, durable and the best part is that it can do more than one function which is huge in an RV. Not only can you move the seating around from a long slender couch but you can switch the seat around so they face each other, add a table and you have a seating for playing cards or eating dinner. We flip our seating around add a table and use it for doing school work, then add the two ottomans that sit behind the last set of chars which add even more seating for the craft table. I especially love the fact that there is storage under every seat and ottoman. 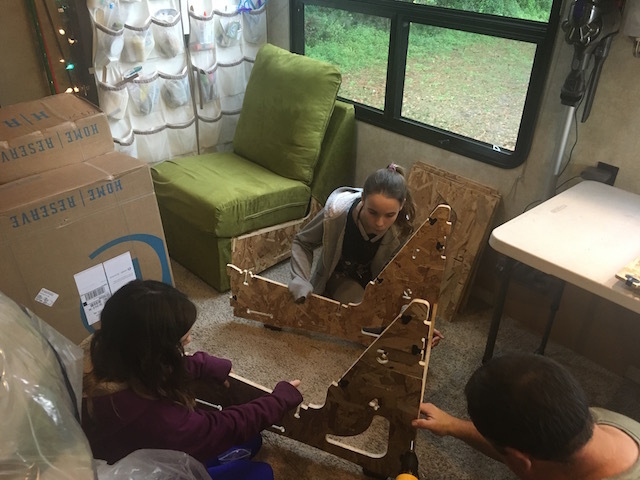 This entry was posted in Engineering, Fulltime Tips and Tricks, Math, Unschooling and tagged couch, easy to assemble, Home Reserve, RV furniture by Chrissie. Bookmark the permalink.